Highland Park held their grand opening on April 20th. The public was invited to tour the community, meet the staff, and enjoy some lunch. Our first resident, David Ross cut the ribbon and was joined by staff, elected officials, guests of the community, and other attendees. Highland Park Senior Living was voted Best of 2017. 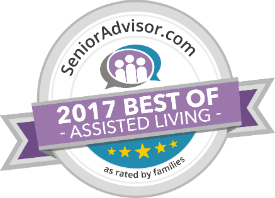 The SeniorAdvisor.com Best of 2017 Award recognizes senior living and home care providers who receive consistently high ratings and positive reviews from residents, families, and visitors. This exclusive designation is awarded to the top 2 percent of providers nationwide.